Are you hoping to accomplish a high-quality paint job without hiring a professional? You are going to need the best airless paint sprayer to get the job done. Using a good quality sprayer will make the difference between an amateur job and a professional looking creation. 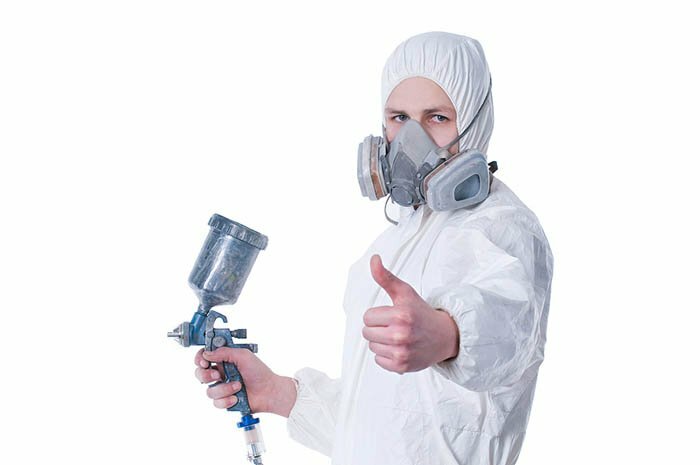 There are lots of paint sprayers on the market today, but there are many differences between them. Get the inside scoop by reading through my comprehensive airless paint sprayer reviews to find your perfect model. I’ve done a lot of research, testing, and painting. My experiences help me to recommend the best airle​​​​​ss paint sprayers on the market. This is going to help complete that painting job quickly and easily. Your projects will look like they were done by a hired professional. How Does an Airless Paint Sprayer Work? An airless sprayer pumps materials through its hose at a high pressure. The nozzle, on the end of the spray gun, is where those materials will pump out. This allows you to have a high-quality finish on any project you tackle. The flow rate of the paint will depend upon the pressure of the gun and the size of the nozzle tip. Most spray guns allow you to change the pattern of the fan to customize your spray to fit any job. The airless spray gun breaks up fluid into tiny drops with high pressure to create a smooth finish. Sprayer motors are operated by three different types of power sources: electric motors, gas engines or compressed air. In the electric and gas sprayers, the motor will create a rotating motion that is then transferred to the drive source of the fluid pump. When a motor is powered by compressed air, the flow of the air through the motor will cause the piston rod to move up and down. This motion transfers power from the connecting rod to the fluid displacement rod inside the pump. In a hydraulic unit, a gas engine will drive the pump. The hydraulic pump draws oil from a reservoir and pumps it to the motor. This causes the motor to power the fluid pump. These are often less efficient than a direct drive model. Airless paint sprayers are often available for purchase at a reasonable price. Professionals and amateurs alike can complete their painting jobs by using an airless sprayer. In addition, money will be saved because you don’t need to overlay the paint many times while working in large areas. You will be able to complete your jobs faster than using a brush or roller. If you purchase a large sprayer, you could even pump directly from the container, saving you even more time. With the right paint sprayer, you’ll accomplish large projects with less effort. An airless paint sprayer will provide an even coating no matter what surface you are working on. You can achieve a high-quality finish even if you don’t have training. Airless sprayers can pump materials of different viscosities. This means they are ideal for painting both interior and exterior surfaces. You can easily change the pattern of the spray to match any project you are working on. To do this, you will simply adjust the controls on the sprayer. You can take these sprayers with you anywhere so you are always ready to complete a job. The fine fluid particles will not all stick to the painting surface. This overspray will spread into the air and could land on other surfaces. There is always the possibility that you will waste some of the paint as a result. You could lose anywhere from 20-40% of the paint depending on the gun and materials. Make sure all surroundings are covered before painting to reduce risk to nearby items. The better you get at using your airless paint sprayer, the less paint will be wasted. There will be time involved with cleaning the pump, hose spray gun, and filter. You may even need to occasionally change the filter. If you are using an oil-based paint, you will need to clean the sprayer with mineral spirits. There are lots of great airless paint sprayers on the market. After a thorough investigation and personal use, I feel confident recommending these choices to you. Ideal for the professional or serious home handyman, this airless sprayer is lightweight and portable, weighing in at just 30 pounds. This is best used on large residential jobs and offers an Endurance Pump with long-life V-Max packings. It also features the Chromex rod and hardened stainless steel cylinder. The QuickAccess intake valve is available so you can easily clean and clear out debris. The consistent pressure control will deliver a quality spray pattern with minim fluctuation. Included with this unit is the FTx Gun, RAC X 515 SwitchTip and Guard, ¼-inch x 50-foot BlueMax II Airless Hose. The reason I love this model is due to performance and ease of use. I have sprayed my entire house with it and recommend it to any serious painting enthusiast. This airless sprayer is ideal for do-it-yourselfers, handymen, property managers or even part-time contractors. The xt250 stand-mounted paint sprayer offers stability for any job. It is lightweight at just 23.3 pounds and comes with a carry handle. This sprayer features a ½-horsepower motor and comes with a ¼-inch x 25-foot airless spray hose that features an abrasion resistant polyurethane cover. Get those jobs done quickly with this airless sprayer. Titan has produced an excellent range of spray guns in recent years. Their sprayers really do rival Graco for quality and affordability. The fully adjustable pressure will give you the ultimate in control over paint flow. The ProX Stainless Steel Piston Pump allows you to spray even unthinned materials at high pressures. The flexible suction tube will enable you to paint directly from your 1 or 5-gallon paint bucket. When you are ready to clean the machine, you can use the PowerFlush Adapter to connect directly to the garden hose. This machine supports up to 150-feet of hose so you have plenty of reach for your jobs. The RAC IV SwitchTip allows you to reverse the tip when it gets clogged so you have no downtime. The SG3 metal spray gun offers a built-in swivel and the in-handle filter will block debris from reaching the tip. Use the prime button for a fast and reliable startup. This is a high volume piece of machinery that I would recommend for a paint contractor or professional. It is built for high performance and to last throughout the years. The fully adjustable pressure from Graco will also give you the ultimate in control over paint flow. This machine supports up to 75-feet of hose so you have plenty of reach for your jobs. The SG2 metal spray gun offers a built-in swivel and the in-handle filter will block debris from reaching the tip. Use the prime button for a fast and reliable startup. I love this paint sprayer because of its performance and simplicity. I always recommend the x5 to my friends who are beginner painters but want to do a professional job. This reversible 517 spray tip is ideal for use with most paint sprayers. It offers the 517 tip (yellow or black) and the Universal Tip Guard (red or gray) for more flexibility on your jobs. The inlet fitting ¼-inch thread, swivel joint makes any paint job easier. This gun head is forged with 100 mesh gun filter inside to reduce clogs. It has a 3600 PSI maximum pressure, four-finger trigger and soft pull feature. An excellent spray gun those those wanting to work with a separate air compressor or just wanting to upgrade their current nozzle. On this unit, you can easily swap out the worn pump within minutes by using 4 simple steps. It will spray 0.47-gallons per minute and supports up to a 0.021-inch spray tip. It will spray 0.47-gallons per minute and supports up to a 0.021-inch spray tip. The 1-horsepower motor can run on long extension cords so you can reach to any job. The Endurance Pump offers exclusive V-Max packings to provide reliability. It comes with an SG3 metal spray gun, 515 spray tip, 50-foot Duraflex airless paint hose, TSL, DVD and quick start guide. Use this to spray heavy latex, stains, and acrylics. This is a quality performer for those looking to spray heavy latex, stains, and acrylics. Especially at a commercial spraying level. Like many of the other Graco models, the fully adjustable pressure from Graco will also give you the ultimate in control over paint flow. This machine supports up to 100-feet of hose so you have plenty of reach for your jobs. The RAC IV SwitchTip allows you to reverse the tip when it gets clogged so you have no downtime. The SG2 metal spray gun offers a built-in swivel and the in-handle filter will block debris from reaching the tip. This unit will also support up to a tip size of 0.017-inch. Use the prime button for a fast and reliable startup. Another quality Graco machine, the x7 is the bigger brother to the x5 and is packed with features. I have taken a step above this tool but it remains an excellent choice for those searching for value. This project is ideal for projects needing 4-8 quarts of paint. Consider using this for your doors, ceilings, furniture or garage doors to get a small job done fast. There is no thinning required. The Tilt-N-Spray pendulum suction tube provides a full motion of spraying from up, down or sideways and never loses prime. The TrueCoat Pro II is also fully repairable to extend the lifespan of the sprayer. You will receive a 515 TrueCoat reversible tip, 32-ounce cup with cover, 5 liners, pump armor storage, start-up tool, instructional DVD, and storage case. Handheld paint sprayers have fast become an essential tool for handymen. This is an ever reliable, powerful and versatile Graco electric model. This sprayer offers a maximum delivery rating of 0.34-gallons per minute and you can pump directly from the 1 or 5-gallon paint container for easy cleanup. Use this with stains, heavy latex, and acrylics. This unit will support a 150-foot hose length and runs on 3/4-horsepower motor. You can use this on a 15-amp household current or with a 1500-watt generator. The maximum operating pressure is 3000 PSI and the maximum tip size is 0.017-inch. This sprayer includes the SG3 gun. The big, big, brother to the x5 and x7. It comes with a longer hose and is more maneuverable than its younger brothers. Great for those wanting all the features at an affordable price. The fully adjustable pressure from Graco will also give you the ultimate in control over paint flow. It is housed on a sturdy stand to remain stable through any job. The ProX Stainless Steel Piston Pump allows you to spray even unthinned materials at high pressures. The flexible suction tube will enable you to paint directly from your 1 or 5-gallon paint bucket. This machine supports up to 150-feet of hose so you have plenty of reach for your jobs. The RAC IV SwitchTip allows you to reverse the tip when it gets clogged so you have no downtime. The SG3 metal spray gun offers a built in swivel and the in-handle filter will block debris from reaching the tip. Use the prime button for a fast and reliable start up. This sprayer was developed by Wagner Spray Tech Corp who is a market leader in paint applicators. This is a good choice for home improvement projects, commercial painting, and industrial finishing. It is made of high-quality materials and comes with a 50-foot hose to reach further than the models which only offer 25-feet. Another quality performer from Titan. The fully adjustable pressure from Graco will is perfect for minor household painting jobs. This machine supports up to 50-feet of hose. The RAC IV SwitchTip allows you to reverse the tip when it gets clogged so you have no downtime. Simialr to the x5, the Project Painter Plus is a superb choice for the home handyman wanting to paint a fence, wall or just about anything. This unit features ½-horsepower motor with strong legs to provide stability during spraying. It offers 2800 PSI and can spray 0.24-gallons in a minute. Use the swivel for the spray gun and enjoy the 515 reversible spray tip for cleaning out those pesky clogs. This sprayer also has a wear-resistant non-sticking ceramic inlet valve as well as the color change to denote cup gun line from Low Boy contractor grade line. This sprayer offers 0.29-gallons per minute and a 5/8-horsepower motor. The machine will support up to a 0.017 spray tip with the commercial grade spray gun. If you are an entry level contractor, maintenance professional or just serious about your DIY projects, this is a great option for you. It comes with a 25-foot airless spray hose but can support up to a 35-foot hose. You can use this directly with a 5-gallon paint bucket for easier cleanup. It also features a variable 1000-3000 PSI. I love Wagner but this is not their best product. It does work well on decks, however, but I prefer Graco and Titan models for most of my airless work. This sprayer will pump directly from your 1 or 5-gallon paint bucket which enables you to have an easier cleanup. It features a 1000-3000 PSI piston pump to give you high pressure and better coverage. The easy-twist pressure control knob will allow you to fully adjust the settings for your particular paint job. The stainless steel paint pickup is easy to clean, doesn’t rust or corrode. This lightweight, durable spray gun with built-in filter has an easy trigger lock for flushing and cleaning. The no. 517 nozzle is perfect for a 12 – 16” fan width. Take your time and make sure you pick the airless paint sprayer that is going to best suit your needs. While there are many great models available, not all of them are going to work in your particular situation. You must weigh all the options if you want the best possible outcome. Read thoroughly through all the Airless Paint Sprayer Reviews to find your perfect painting match.